Opinion (from Deutsche Welle): “Public confidence in the European Union has hit rock bottom, a recent survey reveals. Since the onset of the euro crisis, Europeans have lost faith in the bloc, even in pro-European countries, like Germany. “It’s indeed an all too real risk that Europe might fail due to a lack of support from its citizens. My Comment: Only deeper unification will save the EU and Europe in general. But the unification should take place not at the level of financial and political establishment, but at the level of societies and nations. Baal HaSulam says in the article “The Arvut (Mutual Guarantee)” that if the society cares about each of its members, it can neutralize a person’s egoistic desire. Suppose I go on a “everything’s included” pleasure cruise, feeling carefree since the service actually includes everything I can think of. I settle down in my cabin getting ready to spend two weeks of sheer pleasure. However, as we set off, I am told that this is going to be a eternal cruise. So, I live, and everything is prepared for me: Breakfast, lunch, and dinner are served right on schedule; my cabin is always made; there is a library, a cinema, the Internet, a swimming pool, and so on. Everything is at my service. In addition to that, everyone treats me nicely and is very attentive, and there is nothing to worry about. The people around me are ready to help me at any time and in any way. These are the social principles on this boat, and they apply to everyone without exception. So, how will my nature react to that? Is it possible for the ego to erupt under such conditions? The people around me teach me to annul myself by their attitude toward me, and I don’t look for ways to fill and satisfy myself anymore. For example, I don’t wander in pubs and restaurants in search for delicacies that I haven’t tasted yet, but rather feel satisfied with simple healthy food. Luxuries don’t excite me like before. There, a buffet of desserts is open daily, and it quickly curbs my demands. After a couple of days, I already restrict my “daily consumption,” and after a week, I am satisfied with a cup of coffee and a biscuit. The atmosphere is full of Surrounding Lights that are constantly ready to restrain and calm my ego. The main thing here is the example I take from others and the attitude they teach me. I am in the company of people who are satisfied with little. This is what is accepted among them, and that’s it. They actually don’t need more than that. They prefer to enjoy the good relationships that I now take in portions, instead of food. If I feel gloomy and take a portion of “our love,” I am immediately filled with love. It is because I am in a network of social, human relationships whose message clearly is that I never will lack anything. The feeling itself actually is enough, and nothing else. Initially, by our nature, we depend on environment, and there are no compromises here. So, if the group radiates the right attitude toward me, imbued with tranquility, peace, and good will, then half a day later, I also will feel that everything is exactly as it should be. However, if I find myself in some gang, I also will absorb their principles. There is a natural inclination within a person to adapt to the environment. I simply have no means and no way to fight this inclination. So, within a couple of hours, I become incorporated in the general atmosphere of mutual guarantee and stop worrying about myself. The people around me are my network of connections and are closest to me. I cannot resist their opinion since I am also part of the general network. So, when it is my turn to reveal the Creator, the root of my soul, I am brought to a new type of connection, to a group. The same law operates here: The group tells me that there is nothing to worry about and that I will stop worrying about it. But besides that, it has to convey the message that I must connect with the friends and adhere to the Creator. It’s because self-annulment is not enough, I also need the right direction, And I also will receive this message. My free will is not taken away from me in the group since that simply will suppress me. In spirituality, other people’s opinions are not conveyed automatically. This is another boat that I must choose by myself. The Creator brings me to the ladder, but each step up requires great effort and strengthening along the way. However, do I get stronger? Do I fulfill my free will? Without free will, I never will develop the human within me. A “human being” (Adam) is only the one who pressures himself to enter the group and be incorporated with the friends. Then, I receive everything else from them automatically since I have no control over it anymore. In short, we choose only one thing: the environment. The first and main condition is mutual guarantee. If we are connected in mutual guarantee and provide everyone with everything that they need for self-annulment, then there is nothing else that we need for a start. The second condition is to make sure that everyone has the stimuli and incentives so that they surely will hold onto the friends. This ensures a person’s good fate. Baal HaSulam, “The Arvut (Mutual Guarantee)” Item 17: The giving of the Torah had to be delayed until they came out of Egypt and became a nation of their own, so that all their needs were provided for by themselves, without dependence on others. This qualified them to receive the above Arvut, and then they were given the Torah. The condition for the giving of the Torah, the method of correction, is readiness for mutual guarantee. In general, the Torah is the Light that Reforms, which helps a person to the degree that he is ready to be a guarantor. In other words, the Torah works for a person if he is ready to unite with another, up to the point of loving the other. If the person is not ready for this, the Torah doesn’t work for him, the Light is not shed. After all, the Light only comes as a reaction to a person’s effort to do something for another. This principle resembles an electrical system with resistance (R). Depending on the amount of resistance between me and another, the Light that Reforms, the Surrounding Light (Ohr Makif –OM), will come. There is no other possibility. Hatred can burn between us. Our relationship can be negative (-), neutral (0), or positive (+), it makes no difference. 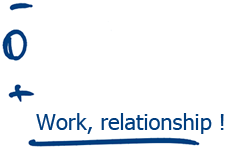 The main thing is that these relationships will be such that work will be done, that the friends will exert efforts. To do this, we need to study so as to learn what we have to attain. We also need the group that establishes the order of activities. 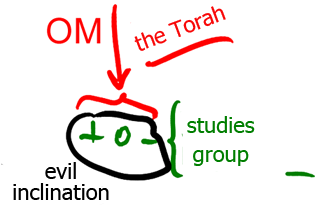 So, the Light that Reforms also called the Torah influences us. And it acts upon us on the background of inner clarification discerned through the evil inclination, which is what provides the resistance. Baal HaSulam, “The Arvut (Mutual Guarantee)” Item 17: When the sons of Israel came out of Egypt and became a nation of their own all their needs were provided for by themselves, without dependence on others. This qualified them to receive the above Arvut, and then they were given the Torah. By uniting among ourselves and building a mechanism of general interconnection out of many people, we create a perfect, whole system. We don’t need anyone in this mutual connection: Everything happens internally, among us. So, these particular conditions were created in those times, and the external environment didn’t influence the sons of Israel. Thus, they became a nation that exists in a state of interconnection and attributes itself to the upper force. 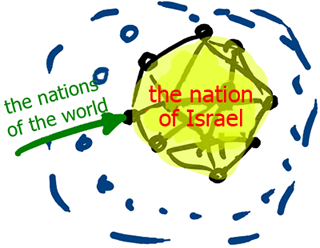 In that case, the nations of the world cannot hurt the nation of Israel in any way. It is because it is on a different level, lives in a different range of frequencies, and simply doesn’t intersect with or touch others. Question: What does a person feel when he is receiving the Torah? Answer: He feels that his attitude toward others is changing. He begins to understand that precisely in relationships with others, there, in the middle between them, is a place for the new world, new states, new development above at a higher level. 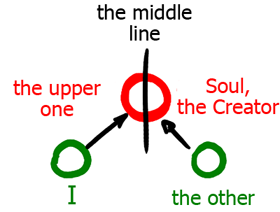 By establishing a mutual connection, we form between ourselves the third factor: the upper one. This is the soul; this is the Creator whom we reveal. This is the upper world, which lies not just anywhere but precisely between us in the form of the middle line. Question: In the process of integral education, the sensitivity of our five senses upsurges. However, a person still has to come back to the real world where he needs certain protection since he continues dealing with various negative situations. How can we teach people to cope with the world they return to after they are done with the integral studies? Answer: After the course of integral studies, people will relate to this world in a different way and perceive it differently. However, we should not teach people exactly how they should relate to the world around them. Rather, we have to change people. If people acknowledge internal changes, they will regard this world differently. In general, we are giving wrong advice to our children when we teach them not to beat someone, not to fight, not to curse. It is not an upbringing. It is similar to taming animals. We must change them internally so that it would be impossible for them to beat, curse, or fight. This is why we need to go through internal transformation and ascend to the next level, rather than just follow a system of prohibitions. This is the mistake of modern-day education and upbringing that orients people to how they should relate to life and to the world. All we must do is to elevate a person. The rest will come naturally. The same applies to science and the arts. Practically, there is no need to teach anybody anything. If we feel others as ourselves, our sensors begin opening. All of a sudden, a person understands from within how to produce nice musical sounds, for example. It is the most natural education. All we need is to raise others and have them connect with the rest of nature, contrary to their innate egoism. Based on this, people “expand,” open up, and become one with the environment. People don’t need anything besides it. In such a case, no one can harm us, nor will we be causing any contradictions or problems to others. People will always feel great since they will stay in harmony with the program of creation. They will never trigger any kind of negative impacts. No matter where we are, there will always be a positive atmosphere and benevolence all around us. Question: Where can people find strength to transition to integral motivation? We usually speak about the crisis and other problems, which push us toward unity, but perhaps there is a gentle click or a phase-like transition to an integral system? Answer: The truth of the matter is that this cannot be done mechanically. This is the first time that nature is expressed very vividly as a single law of a single system in relation to humankind. We have reached a state when we have grown egotistically. We have been developing as egoists over the course of many years and, in this way, nature was pushing us forward. This is why, instead of displaying integrality, the network of the common connection always has displayed its egoistic interdependence: One wanted to make more money, have a better life; another wanted to rule, conquer someone, and so forth. And we realized all these things. This network of connection would always appear between us and, as it manifested through human communication, new nations and continents joined it, but none of this was integral. There was no mutual dependence between them. It was considered that when I conquer someone, he becomes dependent on me, and vice versa, and this applied to everything: art, science, technology, warfare, and politics. Egoism has always controlled us in a single, direct way. I pressure and receive what I need. This network consisted of a combination of egoistic forces that were in a constant struggle with one another; in this way, they controlled nations, humanity, and civilization to a certain degree. However, beginning with the twentieth century, a completely different dependence began to manifest: Specifically, a dependency between these forces, and not simply an inclination to be against each other that forces humanity to fight mercilessly. We suddenly began to tune into one another somehow. It turns out that you no longer can simply destroy a person because, by doing so, you somewhat destroy a part of yourself, a potential of your own development and existence. In other words, we discovered a strong need for every nation in every element of the common network. This can be seen very well using the example of ecology. What would we get if we were to destroy flies? What would be the consequence of destroying wolves? However, this is not the way things used to be. It turns out that we did not have this much power over nature. We did not have the ability to do with it as we pleased. Mainly, there was no integration. There was no quality manifestation of it. We only began to discover this mutual dependence in the beginning of the twentieth century. Vladimir Vernadsky started to write about it back then. Integrality is increasing and will continue to manifest. This is why we need to think about how we can help humanity realize it. Question: The driving force of evolution is the discovery of the global network in humanity. In recent years, this discovery has become expressed in an interesting form called the “wisdom of the crowd” or “crowdsourcing,” when people connect not just in order to talk, but to produce a particular result. That is, this is a true connection that produces something. The result of this connection is always on a higher level than the sum of its parts. What is collective intelligence, the wisdom of the crowd? Why is the intelligence of the group greater than the intelligence of one person? Answer: Collective intelligence began to be manifested only recently. In principle, a collective network that connects us has always existed among us. The entire universe has been considered by philosophers, physicists, and many other investigators of nature as one whole. How can the universe not be a unified whole if it was born from one point and gradually began to extend? In nature, there is no chaos; it can exist only in our mind. When we examine nature, we see clear laws that operate in it, and if we don’t see these laws to the end, either generally or specifically, this only reflects our lack of knowledge. The more we discover about nature, the more we discover the absolute connection that exists in it. This connection exists on all levels of nature. The individual and the society are no exception. They are a product of nature. We didn’t somehow create this and make ourselves like this, even though we would like to think that we are absolutely independent. Rather, the more we advance, the more the laws of evolution of human society are revealed to us. We see how objective these laws are. We cannot do anything about them; we can only specify the facts. Therefore, the network that ties the still, vegetative, animate, and human part of nature is one. In our time, the last, most developed part of nature is being revealed. Human society is beginning to discover that it also is included in a global, integral network; this network is so interconnected that, if we see things through it, we see that it is even impossible to imagine the freedom of choice of a person. We can see that there is nothing accidental here, and so on. Everything is included with absolute precision in this one program of evolution that shows us the absolute interdependence between us and, as we discover it, we understand that we are included within it and that requires us to act accordingly. According to physics research, a person looking at something that is happening in outer space or within the microcosm brings himself into this event and, therefore, this event is subject to change. This phenomenon also testifies to the total dependence between the various levels—in this case, between the human and the still levels of nature. This network of complete, mutual dependence has been discovered by us gradually and, thus it develops humanity, leading it to its integration. The moment this network is discovered, we must correspond to it. Otherwise, to the degree of our lack of similarity to it, to the degree that we differ from it, we experience all kinds of problems, which, in general, we call crises. So, for the first time, we have reached a long-term crisis, which already has lasted for decades. The first ones who saw this perceived it around fifty years ago. They were members of the Club of Rome which began to publish various articles on this subject. Since then, the crisis has continued to evolve, becoming a crisis in the family, in education, in culture, and so on. We are standing before a completely new integrated system. However, since we are individualists, egoists, we cannot accommodate to it. Here, changes are needed within the individual. Because these changes have not yet taken place in us, the crisis will continue, of course. We see how it continues to grow. The network of connection between us is discovered more and more, yet we still don’t understand how much we differ from it. Therefore, it is still too early to talk about crowdsourcing (the wisdom of the crowd). When we gather together, we see that the sum of all our efforts and actions is much greater than the usual summation. A different type of addition is created here. Moreover, this addition is very meaningful. It is as if it is wisdom coming from the next level, as if it is a prophecy, which is to say, it is as if we are seeing a little higher, beyond time, beyond what we can see because, through our joint effort, we enter into a kind of similarity to the integral network. This is happening among small groups of people who are still egoistic. If we could gather a group that was truly integral, meaning that the people within it were to rise to a level of integration with each other as is required by the network, then they would find themselves in another dimension toward which nature wants to push us. After all, according to nature, we are still on the animate level of evolution and concerned only for our body. When we can be concerned about collective intelligence, collective attainment, our integral existence, then we can speak about a true wisdom of the crowd. This integral existence is the image of a unified Human, Adam. This is not a physical image. Rather, it is a spiritual image, a supra-egoistic gathering of all of our characteristics. Baal HaSulam, “Introduction to the Book, Panim Meirot uMasbirot” Item 19: The angel of death comes with a drawn sword with a drop of poison at its tip; the person opens his mouth, he throws the drop inside, and he dies. The angel of death is our ego that cuts us off and distances us from spirituality all the time. And obviously, it does so according to that method, according to that general plan by which we must advance. It has to grow in order to justify its name, the angel of death. We see that, in our day, a global crisis has been revealed. Humanity is gradually coming to understand that the problem is not in bad economy or finances, not in the broken family, but rather in human nature itself. This means that we will not escape the crisis through a simple change of the external system. Ultimately, we reach an understanding that the angel of death lives within us and is killing us. We must kill him ourselves before he kills us. Time after time, he intentionally cuts us off from the good life more and more so that we will feel that we have to kill him. The sword of the angel of death is the influence of the Sitra Achra, called “Herev” because of the separation that grows according to the measure of reception, and the separation destroys him. A person is not prepared to refrain from using his ego. We see people continue to behave egoistically even though they know that they are harming themselves. However, they are compelled to use their desire to receive, and finally: One is compelled to open one’s mouth, since one must receive the abundance for sustenance and persistence from her hands. So, we are killing ourselves from generation to generation, returning to this world again and again with an even greater desire for pleasure and again, swallowing that deadly drop”: In the end, the bitter drop at the tip of the sword reaches him, and this completes the separation to the last spark of his breath of life. People must finally understand that using the desire to receive kills them. No matter how much we burn with new hope of exploiting it, looking for different forms, and trying to overcome it, in spite of all this, we understand that our nature is compelling us to kill ourselves. The angel of death kills itself by showing us what is causing us to die. It arouses us to fight against it. This is reminiscent of the story of the Egyptian exile. At first, it seemed that Pharaoh was good! With seven years of plenty, absolute abundance, it seemed that we had succeeded in controlling the angel of death and that was on our side. However, in the end, we began to feel the seven years of famine. This was no longer the same Pharaoh. The angel that led us through life suddenly became cruel. We used to think that all of life is in front of us: With all the opportunities of the “American dream,” we would continue to progress and get more and more from life. It seemed to us that the entire world opened before us for our benefit. Suddenly, we discovered that we are locked within this world. Every day becomes darker and darker, cramped and horrible, threatening to kill us and, at the end of the matter, we realize that the problem is not in the world. Rather, it is in us, in the egoistic nature that is found within us and inspires us to life, in our angel, meaning our internal power. So, it essentially is fulfilling its role, like Pharaoh who brought the children of Israel closer to the Creator. This is that angel that, through opposition, carries out its faithful work. An angel is a force of nature that has no choice, a part of the overall program that operates until we finally feel that we have no choice and must flee from it.